A few months back you could've found me jumping and excited sharing the news with my best friends. Well yep It was our lunch break in college and I was going through my notifications as I usually do to check up on what's happening around. There was this one email that caught my attention and left me with a blast of happiness. 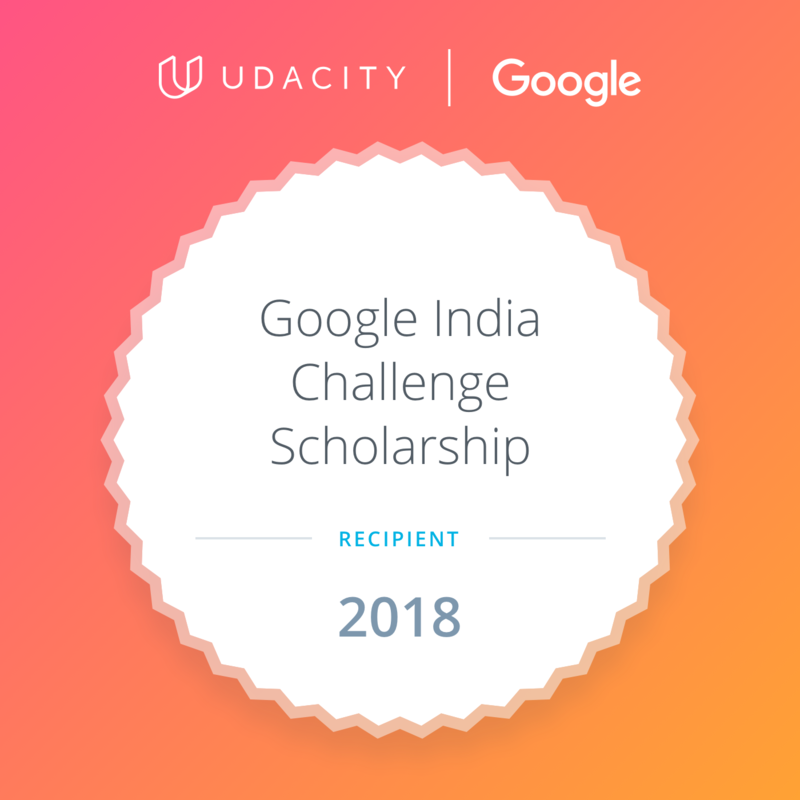 I had been chosen for Phase I of the Google India Challenge Scholarship ( Android Developer Track). I don't exactly remember when and where I had filled this form up, but I remember about getting a email from Udacity about some scholarship course which was about to begin. I had studied the basics in Android Development from the Udacity itself and now wanted to learn it much more professionally and in detail. I had filled up that form and then had forgotten totally about it. The course began on 14th feb 2018. Pretty much pumped up for whats coming ahead, I began the course on the first day itself. The course was filled with a lot of information where some of the topics were already familiar enough while others where deep down filled with details. There was extensive use of Github with the Android studio to pull the source codes and push the finished ones. It was quite fun working out in all these months. Apart from super informative video tutorials, there was a slack workspace dedicated for the members in this course. The community feeling and the feeling of teamwork was awesome. Even after each one of us was working on our own courses the team work feeling while being on slack was overwhelming. For any difficulty or doubt you could just go on to the workspace channel and post your questions. There were dedicated forums for this course along with that. It was a wonderful time learning new things and some older known things in much detail by the people who had much more experience in this regard. The workspace mods and admins were super responsive to all queries and thing that you might need help with. It was such a wonderful experience that I felt I wasn't able to give and dedicate enough time for it, since I was doing it along with my college schedule which notoriously ate upto 12hrs of my day. I so wanted to talk and discuss thing around more. Hope I get another chance for it. Right now the course is over and we all are awaiting the results. Only selected ones will get chance to get in phase II. So here I am awaiting for the Phase II joining email. Do subscribe to blog by clicking here because I update the blog with awesome content regularly. What do you think are your chances of making it into Phase-II ? I didn't make it. I was too busy with my academics and other thing so it affected my performance in the program. Although I hope to get a chance once again.